Starbucks new Blonde Roast coffees are lighter and brighter than any blends that the coffee chain has offered before, designed to appeal to customers looking for a simpler and friendlier cup of coffee. This is a move that other coffee makers, like Peet’s, are taking to appeal to other segments of coffee drinkers, as well. 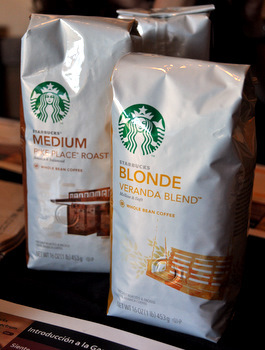 The Blonde Roasts include Veranda and Willow (also available in decaf), and I gave the Veranda a try at a recent coffee tasting. The Veranda is a very mild, bright coffee with a very clean finish. It is mildly acidic, and the flavor does not linger in your mouth once you’ve sipped it. It has a pleasantly grassy flavor to it, but it is not a particularly complex cup of coffee – although I will note that it is much more sweet and refined than your average “mild” coffee from a neighborhood diner. The Veranda seems formulated do brew best in a drip coffee maker. I was also able to get a cup of it brewed from the Clover, which greatly improved it. The Clover-brewed Veranda was less grassy, much more full bodied and and a longer, more flavorful finish to it. The fullness imparted to the coffee by the Clover made it taste quite like Pike Place, although drip-brewed Pike was a bit more acidic than the Clover-brewed Veranda. Long story short: this is a mild coffee that is great for drinkers who don’t love a strong coffee flavor (you know who you are!). It is not going to be your favorite if you, like me, prefer Sumatran coffees and other dark roasts. It’s a fine all purpose drip coffee, but get it from a Clover if you can.